Many foreign residents and tourists buy property on the island, either as a permanent home or as a holiday home. 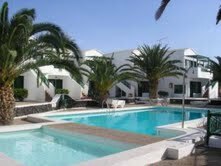 Lanzarote doesn’t have the “Top end” luxury homes that you may find in other areas of Spain, but it does have a great selection of villas and apartments, which range in price from as little as €60,000 and go up to about €2,000,000. Most of the apartment style properties are to found in small communities in the resorts, and nearly all of them have a communal swimming pool, and sunbathing area. Some even have a resident’s gymnasium and private access to the beaches. All apartments have outdoor space, in the form of a patio or balcony. Villa properties are generally, but not always, bungalow style and many have private swimming pools. Once again, the emphasis, thanks to the climate, is on outdoor, rather than indoor space. Most families will eat outside all year round, and the outdoor space is often arranged with a mixture of shaded and sunny areas. Buildings are simple construction using breeze blocks, although the original Canarian building used local stone. Designs tend to be simple, and as there is no gas on the island, properties are all electric. Drainage is inadequate when it does rain, but it does so very rarely! No properties on the island have central heating, although in the far north, some have open wood fires for rare cold nights. All new properties must carry a ten year builders warranty, but there is no settlement or movement on the island, so major structural problems are unheard of. The architecture is very strictly controlled, based on the ideas of Cesar Manrique. 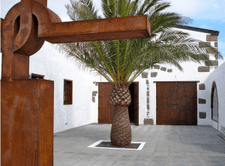 Planning permission is complex and strict, and the result is a uniform “Lanzarote style” for all buildings on the island. Permission must be obtained for any building works, and extensions to properties will only receive permission if the total surface area of the property remains within a strict ratio to the land area. There is no natural water at all in Lanzarote, so all our water is desalinated from the sea. It makes it a precious resource. For that reason, most gardens use indigenous plants, which can cope with low moisture. That means plenty of cactus and palm trees! You’ll also find that gardens are surfaced with small crushed black rock – this is volcanic rock and is known as picon. It attracts what little moisture is in the air as it cools in the evening. Once you have viewed a selection of properties and narrowed it down to a shortlist of 1 or 2 then you need to take a closer look at the area, community, noise level etc. It may be wise to revisit the property at a different time of day if you are unsure of the location. There are strict building regulations on the island and if you are planning to extend or add a swimming pool it would be advisable to check with the local Ayuntamiento that the necessary licences will be authorised. Although you can purchase a property without a lawyer, we strongly recommend that you do use one to check that the property has legal title and is free of debt. Normally within 2 weeks, your lawyer or agent will draw up a purchase contract for both parties to sign. This contract confirms the buyer and seller, the price agreed, the deposit paid, the property details, a completion date and provides protection to either side if one defaults. The standard term is that if the vendor defaults they have to refund double the amount of deposit paid and if the purchaser defaults they lose their deposit paid. Once this contact has been signed and exchanged, the 10% deposit is paid to the vendor pending the completion of the notary. This is a great system and although not 100% guaranteed, there are few sales that don’t complete after this point. Whilst you may be nervous at the thought of attending a Notary, these can quite often be a long wait and a bit of an anti climax! It’s normally an early start on the day and we will accompany you to the designated notary. You normally need to go to the bank first to sign the mortgage papers and authorise the payments for the notary. From the bank you head to the notary where you have to provide your identification which is your passport and NIE/F or residencia, the notary will then prepare your escritura for the property and mortgage if required. Once the paperwork is ready you will be taken by an official translator to have the escritura and mortgage details read to you in English – this is your opportunity to ask any questions. Once you have checked and agreed these documents you are normally waiting for the bank manager to arrive with the money! You can be waiting a few hours in the Notary, please take a drink and food if you think you will need it and something to keep any accompanying children amused. The actual procedure in front of the Notary takes approximately 15 minutes where they read the escritura aloud in Spanish and both parties sign the documents including your translator. You will need to pay the translator at the Notary so make sure that you have extra cash towards your costs with you. Although the keys are normally exchanged on this day you don’t actually own the property until the sale is registered and the taxes paid. A week after the Notary your escritura will be available to collect from the Notary which your bank or your lawyer will do along with paying the purchase tax of 6.5% to the Registro de la Propiedad in Arrecife. Your laywer will contact the services and community to transfer the water, electric and community charges to your details.